Preview: The Bruins may have lost the highly talented QB Brett Hundley, but with nearly everyone else back this team still has the ability to build on their successful 10-3 campaign in 2014. UCLA didn’t quite reach their ultimate goals last year, but winning 10 games including a bowl win against Kansas State isn’t something to be disappointed with. Head coach Jim Mora has done a solid job returning respectability to the UCLA program and he’s picked up a 29-11 record through his first three seasons as the head man. With Hundley off to the NFL the offense needs to find their next QB to step up and lead a unit that returns 10 starters. It looks as though top high school recruit Josh Rosen has the inside track to earn the starting QB job and he’s aided by running a similar offense in high school. Whoever wins the starting QB job will work behind a veteran O-line which returns all 5 starters. The run game is in great hands as breakout tailback Paul Perkins is ready to build off of a strong 2014. The Bruins also return their 4 starting receivers and there’s clearly enough veteran talent to help along the young Rosen if he wins the job. Even though UCLA returns 8 starters on the defensive side of the ball a number of defensive leaders have moved on to the next level. Even without some of their key contributors the Bruins remain talented and deep on the defensive side of the ball. The defensive front 7 should be the strength of the defense and this unit returns 5 of the 7 starters from a season ago. The front will look to get pressure with up and comers like Hollins and McKinley. The LB corps will be led by Myles Jack who’s likely playing his final season for the Bruins before heading off to the NFL. The secondary has question marks, but this unit is hoping to build some positive momentum around three returning starters. 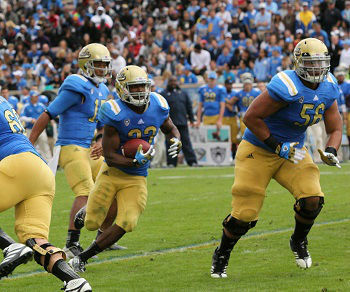 Prediction: Last season UCLA came into the year with a lot of fan fair given the return of promising QB Brett Hundley. With Hundley off to the NFL the team is in search for the next option under center, but it looks like Rosen has the ability to be the real deal. With so much returning experience the Bruins might not take a step back like many think. Look for the offense to lean on Paul Perkins early on while the new starting QB gets his feet wet. UCLA has a tough schedule, but anything short of double digit victories would be a disappointment.